Modern hunting has come a long way. You can now stay still in one position without being detected. A ground blind or more popularly known as hunting blind is a great tool to get close to targets without being detected. It can be moved anywhere and provide excellent cover from animals and natural elements. Looking for the best ground blind? We’ll guide you in choosing the best hunting blind with some of our useful tips and reviews! There are a lot of choices for ground blinds. Here, we feature five of the best hunting blinds which you are ought to check out. You can depend on Primos when it comes to your hunting apparel and equipment. The Primos Double Bull Deluxe is one of your most needed items to ensure stalking prey without getting caught. It has more than enough room to store your gear and one more person inside. It’s a must-have for hunters who want to move stealthily. The Double Bull Deluxe’s main feature is the double-wide door opening that doesn’t make any noise. Primos sparked a change among the hunting blinds because it doesn’t use noisy zippers. Instead, the door is opened by pulling the string which in turn pulls the door flap up and allows entry for large-framed hunters even with their hunting gear on their back. Once inside, closing the door is through a large buckle and two S-hook style fasteners. The ground blind features a panoramic 180° full front view with the adjustable Silent Slide window system. The large window can be adjusted depending on the hunter's needs. Moreover, there are other small windows to aid the hunter in seeing all directions. Looking at the inside, the blind has an entirely black interior to mask the presence of the occupants. The human scent is also masked due to the scent blind base flaps. Primos Double Bull's other main feature is its use of their patented Power Hub Framework to give long-lasting durability and lessening of the wind flapping. It is a rotating locking hub made from magnesium metal and prevents pinching with its over-molded design. Thus, the force required to setting up the blind is halved. Setting up and takedown of the blind can be difficult for a first timer. The instructions given can give you a hard time at first. We suggest that before using the blind in hunting, it’s better to set it up beforehand so that the fabric would get used to being stretched. With this extra steps, you can easily pack up the blind next time. 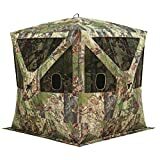 Other accessories that will come along with the hunting blind include replaceable mesh window panels, four ground stakes, deluxe, and an oversized carry bag. However, we observed some discrepancies especially on the bag and the stake down straps. The former’s buckles straps won’t stay in place and slip through. Likewise, the stakes’ straps are too short and must be replaced with something longer. And lastly, this pop-up blind is covered by a limited lifetime warranty. Floor space: 60" x 60"
Everything about Barronett Blinds Big Cat 350 is large. You can squeeze in three hunters inside or most probably some extra, heavy gear like camera and tripod to document your hunting. It is tall enough for someone who is more than 6 feet to stand in! All in all, this is the best hunting blind recommended to those who want to feel comfortable with the extra space. This blind uses sturdy materials to make up its construction. It has a pop-up design and is quickly set up through the five hubs with tie-down ropes and ground stakes. The fabric material is made to be both waterproof and weatherproof to endure the most extreme of the weather conditions you might encounter. As for the interior, it is blackened to mask the movement of the occupants. The Big Cat 350 is a great blind for bowhunting because you can aim clearly by standing. There are replaceable shoot-through mesh windows for broadhead use. There are other multiple windows around the blind to deliver a 360-degree view. Likewise, the windows are zipperless for a noise-free adjustment. It comes in two camouflage patterns. One is for wooded areas (Backwoods Camo), and the other one is for grassy areas (Blades Camo). One disadvantage of the Big Cat 350 is that it’s prone to fading. Once faded, the ground blind wouldn’t blend well with the surroundings and may reduce the concealment factor. Other accessories included are the ground stakes, gear pockets, and tie-down ropes. Another hunting blind by Barronett Blinds is the Pentagon. It has a unique design of having five sides, hence, the name. Its large interior is targeted towards groups of hunters with members at a maximum of four. We recommend that you get this blind if you like hunting in groups. Pentagon claims that it is 70% bigger compared to other four-sided ground blinds. In fact, it is the first of its kind. It can seat four people and enjoy hunting through the nine large windows that can be shot through. They are recreated from a replaceable mesh. These zipperless windows create a panoramic view which makes it possible to view from all sides. Moreover, they give an opportunity to aim in all shooting angles there are. Aside from bowhunting, the blind also allows rifle hunting through the three gun ports. The blind used thicker and stiffer fiberglass poles along with stronger hubs. 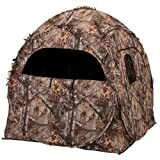 This is a great hunting blind in all aspects with minimum drawbacks. Before buying the hunting blind, inspect it thoroughly for tiny fabric holes which may allow the water to seep through. Barronett Blinds Pentagon is sold in a unique design, the Bloodtrail Backwoods Camo. It also comes with black carrying bag, ground stakes, and tie-down ropes. If you’re short on a budget but still want to look for a ground blind for concealment and protection, the Ameristep Doghouse is one of our strongest recommendations. It allows both bowhunting and rifle hunting. The framework consists of spring-steel poles which deliver convenience and flexibility. The 150-denier Durashell nylon shell is proved to be quiet. As for the interior, it is blackened thoroughly to reduce the visibility of the occupants. The carbon-enhanced interior manages the odor so as it won’t be picked up by animals. The ground blind has seven large windows, three of them are shoot-through mesh windows design for broadhead use. We observed that the windows aren’t big enough and are too low to shoot with a bow while seated. If you’re tall, it would be a challenge for you to stretch your legs to make the shot. The Tangkula Ground Hunting Blind is another affordable blind on the market. It can cater a small group of hunters so you can have a fun hunting experience with your peers. This blind is a pop-up type with its lightweight and durable fiberglass frame. Setting the blind up is easy and can be done under a minute. It has six full view windows, and there are four other mini windows to provide 360-degree visibility. The Tangkula Ground Hunting Blind is spacious and can seat two to three people at once. All the better if you are alone because you can store your hunting gear on one side and relax your legs while lying in wait. We couldn’t find any disadvantages about this blind. It is one of the prime examples of a hunting blind you can enjoy without worrying. However, since it's available at a lower price compared to the premium blinds, there's no guarantee that the Tangkula would last as long. It only weighs 12 pounds and very portable to set up anywhere. It comes with its storage bag so you can easily stuff it inside and also for safe keeping. 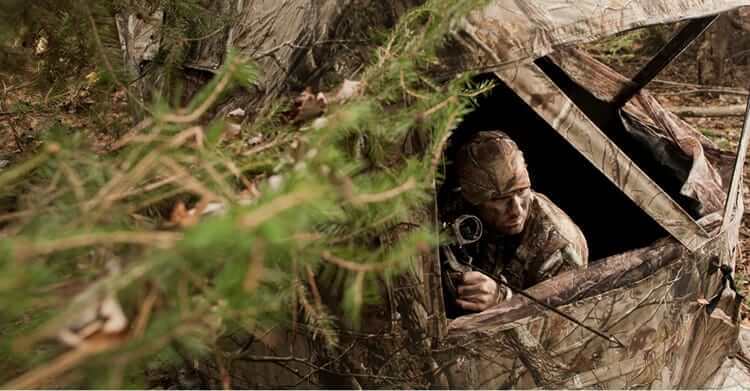 The obvious advantage of a hunting blind is its concealment. But there are other features you can enjoy when you’re using a ground blind in real time. One of them is you can use a blind as a shelter. It can protect you from hot or freezing temperatures as the material used has temperature control attributes. Thus, you can hunt longer in comfort. You are also protected from raining because of the waterproof or water-resistant materials. Another advantage is the blind’s portability. As you should know, they are lighter compared to tree stands. Thus, when using a hunting blind, you can easily move to target-rich areas. One of the causes is it's very easy to set up and take down the ground blind in under a minute. Ground blinds may all look the same. However, there will always be something that sets one apart from the other. Ground blinds come in many designs. Popular types are the portable and pop-up blinds. Portable blinds are portable and could be easily transferred from one location to another. They are usually open at the top so that you can hunt inside of it by standing or sitting when the animal comes your way. Pop-up blinds, on the other hand, are lightweight and opened by popping up. This type has a release mechanism where you would activate to set up the blind. In closing, just fold the blind in its original position. 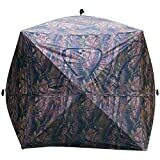 As you would stay for long periods inside the ground blind, then, the thing you should buy must be spacious so you can easily move about while hiding. 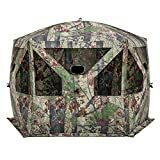 We recommend that you purchase a ground blind that has at least a two-person capacity for a more fun hunting experience. The more advanced blind models offer 360-degree visibility where you can see your surroundings clearly. On the other hand, cheaper models don’t have this feature and can prevent you from getting a good look at certain angles. 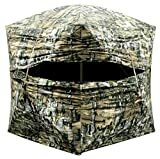 The design of the ground blind you should be buying must blend well into the surroundings or hunting area you frequent. Different terrains like wooded or grassy may influence the predominant color of the common camouflage patterns. Animals can detect human scents. Thus, they would steer clear away from you. The hunting blind we recommend that you buy should effectively hide your scent. Most models available on the market have a certain substance like carbon lining that traps the scent inside the blind. The size of the hunting blind must be considered depending on how many people will be using it. Hunting alone or with a partner belongs to the standard sizing. Also, it’s a common impression that as the blind size gets bigger, it will be more expensive. The best ground blind must emphasize concealment and portability. Hunting involves moving through locations where there’s abundance of prey, so it’s only natural that the blind should be lightweight and blends well with the surroundings. Through our short guide and some reviews of the best hunting blinds this season, you are now ready to own yours for the coming hunting trip! Soooo, one blind leaks water and the shooting windows are too low. A second blind may not last long. You’re either new to the ground blind scene or picked 5 blinds and decided to call them the “best”.